Shortcut: Download this link to an exported GTM container with JW Player integration. Simply import (merge, rename conflicts) the file into your desired GTM Container. Greg Magdsick, a father of three who grew up in Minnesota, recently finished an internship with Analytics Pros. He joined us during a break in semesters as part of the Code Fellows Advanced Software Development program. We wanted to showcase one of the projects we assigned him during his short stay. The assignment was to develop a Google Tag Manager integration for JW Player 7. We pointed him to the JW Player 7 JS API reference document and let him get to work. We will let Greg take it from here and show you what he came up with! When JW Player updated their player to version 7, they updated their API. The new API is backwards compatible with version 6 but is considered deprecated. They recommend you update your API calls to the new standard. You can use this guide to accomplish this! We use the dataLayer object to store information about the videos. 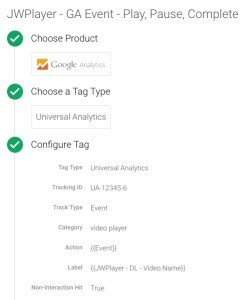 The object structure used in this guide includes player ID, video title, url, duration, etc… The GA tags will access this information using GTM Data Layer Variables. Every GTM tag needs a “trigger”. Our trigger evaluates when the “Window Load” event posts. 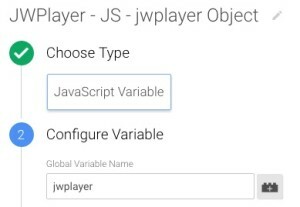 At that time, the trigger checks for the existence of the “jwplayer” object. If true, fire the tag. If false, do nothing. There are many JW Player events that will be pushed to the dataLayer. 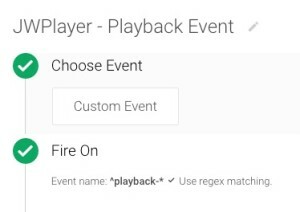 Our implementation includes major events like “play”, “pause”, and “seek”, among others. You can extend the code to cover additional API events as per your business requirements. 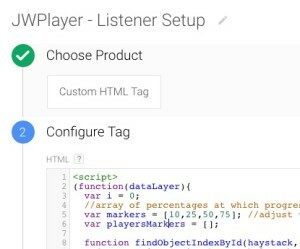 We will start with the “JWPlayer Listener” tag. This tag This tag is the glue that connects GTM to the JW Player JS API. You now have a fully functioning JW Player 7 + GTM integration! If you wanted to save some key strokes: Shortcut: Download this link to an exported GTM container with JW Player integration. Simply import (merge, rename conflicts) the file into your desired GTM Container. Leave your questions in the comment section below, thanks!